Joe Dobbes’ knack for enterprise, evident even from an early age, is the defining characteristic for the winemaker now celebrating 30 years in the business. 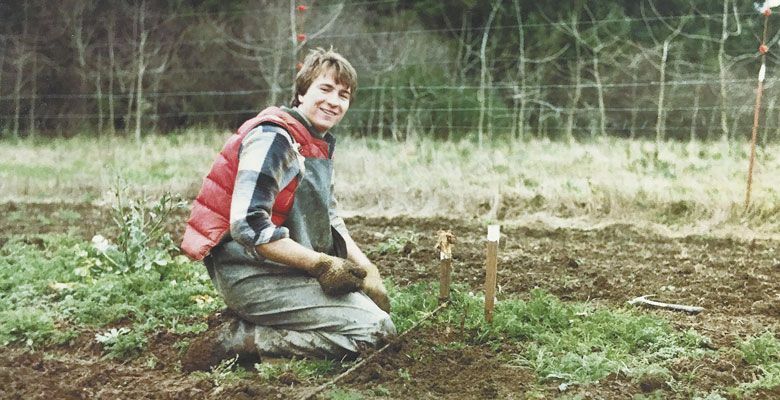 Growing up on a 62-acre “gentleman’s farm” in Molalla, Dobbes farmed a couple acres offered by his dad — later to become the founder of Marquam Hill Vineyard. “So I grew Marionberries and sold them to Smuckers,” he said nonchalantly, as though this pastime was ordinary for a grade school child. “I am as much of an entrepreneur as I am a winemaker,” Dobbes noted. So, it is no surprise that when Dobbes started his winemaking career, it would be filled with brave innovation. In 1999, he made the first commercial Viognier in Oregon, Griffin Creek Viognier for Willamette Valley Vineyards. He pioneered a semi-sparkling Muscat for Tualatin Estate — a wine served at the White House — and, until recently, he was the sole producer of Grenache Blanc in Oregon. Dobbes is also among the first Willamette Valley winemakers to purchase fruit from the Rogue Valley — he continues to craft vineyard-designate Syrah, Grenache Blanc and Viognier from Quail Run Vineyards. “I took chances that scared people, including myself,” Dobbes laughed in retrospect. Not the least of which was leaving his last “W-2” job at Willamette Valley Vineyards to start Dobbes Family Estate and Wine by Joe in 2002. “Wine by Joe was daring from a market standpoint,” Dobbes explained. The concept of offering a serious yet value priced Pinot Noir was relatively new. In 2011, Wine by Joe was named the No. 1 “Hot Small Brand of the Year” by Wine Business Monthly. Even though it was intimidating, when asked what he would do differently, his response was, “Not much.” Dobbes says he would actually have trusted his instincts more. He attributes much of his success to his team, advising others with entrepreneurial dreams to “hire the best people you can afford, even if you can’t afford them.” Surrounding himself with a talented crew and partners was essential, including taking on equity partners, Bacchus Capital Management, to help elevate Dobbes Family Estate to the next level. Dobbes’ career has also been defined by relationships interwoven over distance and time. It was a recommendation from Dominique Lafon — Dobbes apprenticed with her in Burgundy — that eventually lead to his pivotal position at Willamette Valley Vineyards. In fact, Jim Bernau, founder of Willamette Valley Vineyards, kept Lafon’s letter of recommendation as a keepsake. 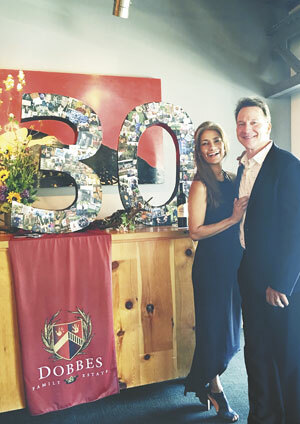 To celebrate 30 years as a winemaker, Dobbes recently gathered at Portland’s Irving Street Kitchen with his family, team, old friends and former employers to share wine and reminisce. Of course, the people who know you best don’t always tell stories about your finest moments — a mark of true friendship. Joe Campbell of Elk Cove Vineyards remembered a young Dobbes who believed the ladies would like him for his good looks — legitimate assumption, for which there is photographic evidence — and winemaking skills. “I think the draw was really his Camaro,” laughed Campbell. A couple stories shared a theme: lost wine. Two hundred gallons at Elk Cove because the hose was not hooked to the filter. Three hundred gallons at Sylvan Ridge because Dobbes forgot to close the valves after cleaning the filter — the wine backed up through the water system and made a surprise appearance in the bathtub. There were many heartfelt moments during the anniversary lunch. Dobbes caught the eye of his daughter, Amelia Dobbes, and choked up a bit while thanking the group. He recognized his wife, Patricia Dobbes, nicknamed “Joe’s Boss,” for her support. Obviously, there are many ways Dobbes can measure his success. To learn more about Dobbes Family Estate, Wine by Joe, Jovino and upcoming events celebrating Dobbe’s anniversary, visit www.dobbesfamilyestate.com or search for the hastag #cheerstojoedobbes throughout social media sites.